Rotherham youngster Sophie Gabbitas couldn’t believe her luck when her dad Paul broke the news that they had won tickets to see pop group Little Mix at Sheffield Arena. The competition is part of the #ill_legalhighs campaign led by the South Yorkshire Police and Crime Commissioner Dr Alan Billings and supported by the football teams; Barnsley Football Club; Doncaster Belles; Doncaster Rovers; Rotherham United; Sheffield United; Sheffield Wednesday and Sheffield Steelers. The tickets were donated to the campaign by Sheffield Arena. Sophie (9) from Wickersley in Rotherham is a huge fan of Little Mix and now has the opportunity to see them at their sold out show on 1 April 2016. 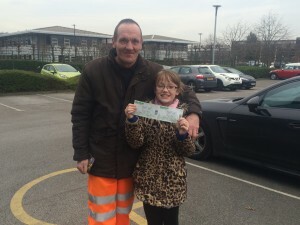 Her dad Paul entered the competition on Twitter and Facebook daily to ensure he had as many entries as possible. Sophie said: “I am really excited to be going to see Little Mix. They are my favourite group and I love Perrie, who is my favourite. I didn’t even know that my Dad was trying to win the tickets so it was a big surprise when he told me we had won tickets. “Since winning the tickets my Dad has shown me the ill_legalhighs website to look at the photos of the footballers. I support Rotherham United, but I was disappointed that Matt Derbyshire’s photo was not on the website as he is my favourite player. The ill_legalhighs campaign was launched in October 2015 and uses images of local footballers displaying key messages on the dangers of legal highs. The campaign runs across social media accounts Twitter and Facebook and has more information on this website. Dr Alan Billings said: “I am very pleased for Sophie winning the tickets to see Little Mix. I am sure they are a very good group and that Sophie will have a good time.